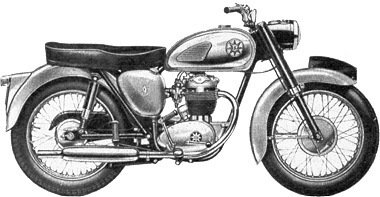 A few years after the introduction of the 249cc C15 - known as the " 250 Star ", BSA announced the 343cc B40 Star in 1960. 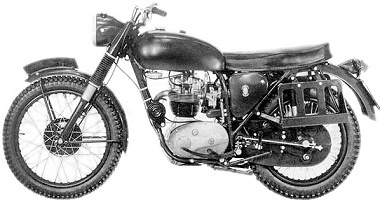 By that time, the British Army was looking for a replacement of their ageing Despatch Rider machines - like the BSA M20 and Matchless G3L - it was using, and BSA started work on a modified B40 to meet the army specifications. Easy maintenance and off-road- capabilities were needed, so the frame of the competition model was chosen, together with a detuned competition engine and close-ratio gearbox. The older front forks - now with rubber gaiters - and the old (!) front brake was used with a 20 inch wheel rim. 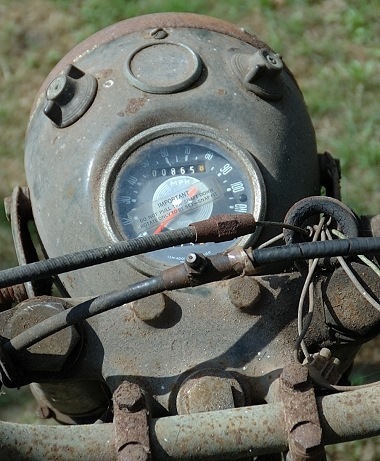 Fuel tank was similar to the fifties' Gold Star ( the righthand fuel tap is set forward to make room for the battery - situated above the gearbox ) and a butterfly type Amal carburettor was used instead of the normal Amal Concentric. A quickly detachable rear wheel and Rear chain enclosure and 12 volt electrics were other features. Weight including panniers, was 160kg - pretty heavy for such a small machine ( the standard B40 was 130kg ) . This B40 WD ( = War Department ) as it was designated, was delivered from 1967 to 1970 to the British, Danish and Australian army. Above: 1960 publicity shot of the new 350 Star, the B40. Above: A factory photograph of the military version of the BSA B40. 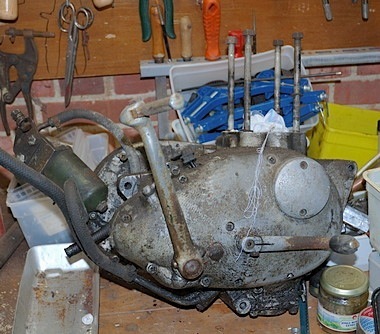 One day, I was asked by a friend to have a look at " an Army Type " BSA that refused to run. It was left at his place by the previous owner who was tired of its unreliability and the trouble to get it started, so he gave it to my mate. The first photograph I took of the machine, a few hours after it arrived at my place. The engine and other bits were already tucked away. Though I knew the bike was in a pretty sorry state ( I had seen it a few years earlier ), I couldn' t let him dump the bike just like that, so I went to collect the machine ten minutes later. Now, since selling my Triumph years before, I hadn' t owned another bike and used the family car or my old Triumph ( ! ) bicycle for transportation. Working at home as a freelancer, I only sporadically need motorized transport, so I figured the BSA could be the perfect candidate to keep me mobile. As a matter of fact, a B40 had been on my mind for a while, since I had been riding - and repairing - several of these machines in the past and always found it an enjoyable bike. 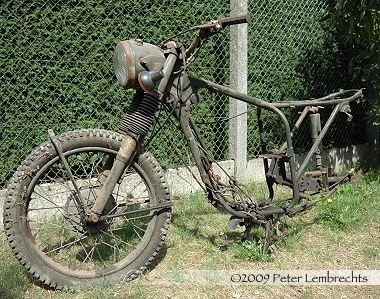 Having restored motorcycles before, I figured this one would be quite easy and be rideable in four or five months time. Nice ! The bike was complete ( only missing the right hand footrest ) and a few days later, it was dismantled to the last nut and bolt. The engine found a place on my crowded workbench. It was partly dismantled many years before and looked rather tatty, but turned out to be in fairly good condition.